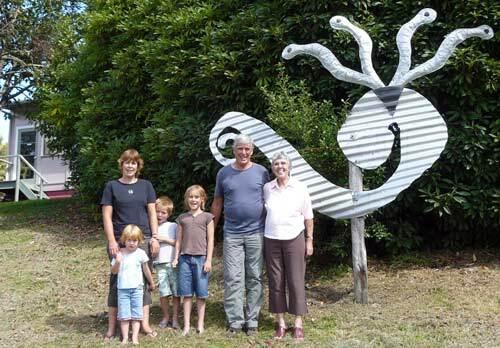 Three generations of the Inwood/Roundhill family stand beside the sculpture of an īnanga (native fish) outside the Īnangahua school, which all have attended. Rebecca Inwood (left) is developing a farm with her husband. Like many West Coasters, she left to attend university, but decided to return. I was an earthquake baby, born the year after the 1968 Īnangahua earthquake. My father's family has been farming at Īnangahua for three generations and, although my husband and I are not farming on the family property, I am a fourth-generation farmer at Īnangahua. I was raised on a dry-stock farm as a child, and went away for the last two years of schooling, and then to university to study law, with the firm belief that I would never be returning to the West Coast – not because I didn't have a fantastic childhood, but with the feeling that the world had a lot more to offer than rural life at Īnangahua. After work and travel overseas, I returned for a job at the West Coast Regional Council. I enjoyed the job immensely as the region is very challenging from an environmental perspective, with dairying, mining and, back then, forestry as the mainstay industries of the West Coast. The people also made the job interesting, with the wide mix of lifestyles ranging from the more alternative to the 'born and bred' Coaster, who saw any involvement by a council as a direct violation of their rights as a landowner. While working in Greymouth I met my husband, who also happened to be a dairy farmer at Īnangahua, and now, 10 years later, I find myself back where I started, raising my own family and sending my children to the same school that my father and I attended. For me being a Coaster is part of my identity and I can't imagine living away from the mountains and native bush, and, of course, the 'hard case' West Coast personalities. In this day and age it seems many young people drift away from the region as they finish schooling, but we feel privileged to be able to bring our children up in this social and physical environment that is the West Coast.